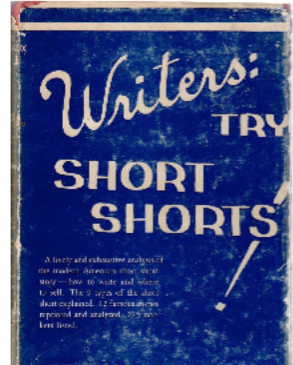 I have a copy of the 1948 second edition of Writers: Try Short Shorts! by Mildred I. Reid and Delmar E. Bordeaux, published by Bellevue Books, Rockford, Illinois. Mildred got her handsome photo on the back of the dustjacket. Delmar did not. 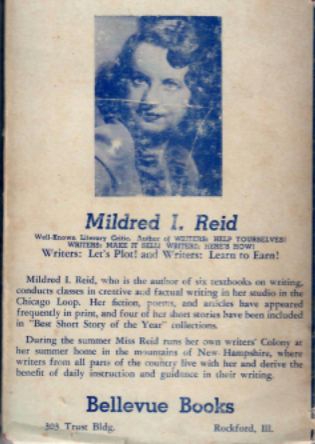 We learn that Mildred conducted writing classes at her studio in the Chicago Loop and at her writing colony in the New Hampshire mountains. We learn nothing about Delmar. But a quick look on Amazon reveals that our man Delmar is the sole author of Cosmetic Electrolysis and the Removal of Superfluous Hair, which sounds like a delightful title for a very short story. Amazon will let you have the book for $299.99, not eligible for Prime. We also learn that Delmar’s middle name is Emil. Mildred and Delmar list the eight types of short shorts: the Complication Short-Short; the Character Short-Short; the Decision Short-Short; the Reconciliation-Alienation Short-Short; the Psychological Short-Short; the Dilemma Short-Short; the Parallel Action Short-Short; the Identity Short-Short. All of which are explained in Flash! All of which you get to write!